Browse: Home » 2004 » June » Fixed them! Or at least, I hope they’re fixed. Looks promising right now. Peculiarly enough they were both heat problems. 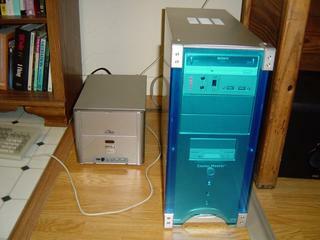 Here are the two machines giving me trouble: the server on the left, my workhorse PC on the right. 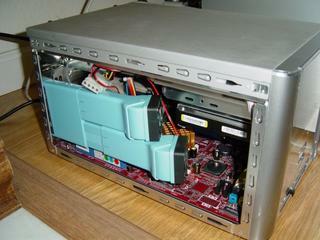 Usually the server sits atop the big PC. I swapped out the 512MB stick in the server for the two 256MB sticks in the PC, so that I could upgrade the PC by adding another 512MB stick (and still have it run dual-channel). After doing this, the server would run for about 80 minutes, and then crash with a crazy Linux core dump. I used the fabulous memtest86 program to verify that the memory sticks were all good. Pulling the 256MB stick out allowed the server to run continuously, so it seemed that heat problems were confirmed. These little servers are notorious for heat issues, especially when running a hot chip like the Athlon 2500+. Fortunately I had a little dual-fan PCI slot device lying around, so I plugged it into the machine, adjusted the fan positions, and rebooted. So far so good, it seems to be working great! The PC was a bigger problem. I actually was fairly certain this wasn’t a heat problem, since the case is open and empty, serviced by several fans, and it didn’t seem to matter how much memory I had in it or in what slots. The PC had just started randomly crashing about a month ago, usually while under heavy load. I questioned the Bios, the motherboard, the graphics card, the memory, and the hard drive. I swapped out everything but the motherboard, power supply, and DVD drive at some point. At some point while dorking around, after having re-installed WinXP the third time, I noticed that the heatsink on my CPU was incredibly dusty. Now, with your normal heatsink, maybe this isn’t a problem, but with the Zalman Flower I’m using (very quiet, with a slow fan), if the flower petals can’t be cooled, the thing just won’t work effectively. I was out of compressed air, so I used a Q-tip and alcohol to clean it off a bit. Booted the beast back up, and successfully played through a game of Rise of Nations with no crash. Hmm, that’s a good sign. Next I downloaded SiSoft Sandra, and ran burn-in tests while watching the temperature. Seemed okay, but yup that temperature went up pretty high. Lastly, I downloaded Motherboard Monitor 5 and logged the system and CPU temperatures while playing a game of Rise of Nations. Sure enough, under heavy load the CPU arcs about ten degrees. Without effective cooling, I bet it was getting a lot hotter. No wonder the system was hanging – it was melting! A short trip to Fry’s later, and I had a can of compressed air and a piece of foam to tape over the vent holes in my case. Tagged a spare case fan in there, and now the machine seems to be working really well. Unfortunately that spare fan is a noisy one, so I’ll have to go back to Fry’s again and find one that is quiet (that fits this form factor). I have one of these quiet cylinder fans elsewhere in the case, and it’s awesome, but I have no room here. I guess for the sake of completeness I should mention the other cooling solution I have in the case: a Super Tornado power supply. 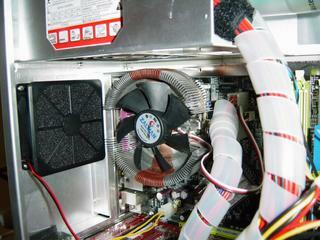 It has a huge fan on the bottom, and a mesh backside, to promote good air flow.